Since the Mawata Colossus post, a lot of people have asked me how it all works: how to knit with mawata, and how to make quilt-ish blocks from them. One day, these will be a blanket. Since it’s a pretty loosey-goosey process, this series of posts will describe how I make the blocks, more as basic formulas than real, gauge-specific, tested and edited patterns. Do let me know if you find any problems with the instructions, though; I’d like these posts to be as helpful as possible. 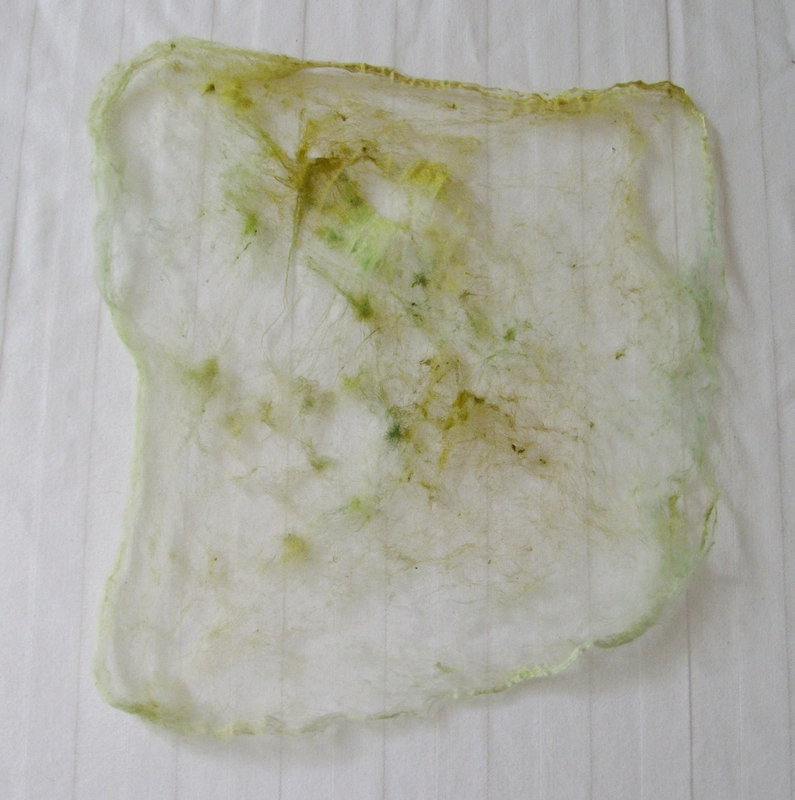 Mawata (or silk hankies) are silk cocoons that have been stretched over a frame, one on top of the other, until you have a stack of gauzy, transparent squares. You may also find them in the form of silk caps, which are the same things stretched over a bell-shaped form. Wormspit has an excellent post on how to make mawata, which is helpful even if you won’t be making your own, as it explains the structure of the thing you have in front of you. The process involves dead silkworms, so if that sort of thing gives you the shudders, you have been warned. Fresh out of the bag. If you’re lucky, the mawata arrived in a tidy, flat package like this. (If they didn’t, though, it’s not a big deal — the same principles apply, it’s just a bit more fiddly.) To pull off the top hankie, look at the corners (where the layers are the thickest), and separate the top layer from the bunch. I think I’ve got two layers here, as the top layer was almost nonexistent. One (or possibly two) layers from the stack. Not perfectly centred. Not a big deal. 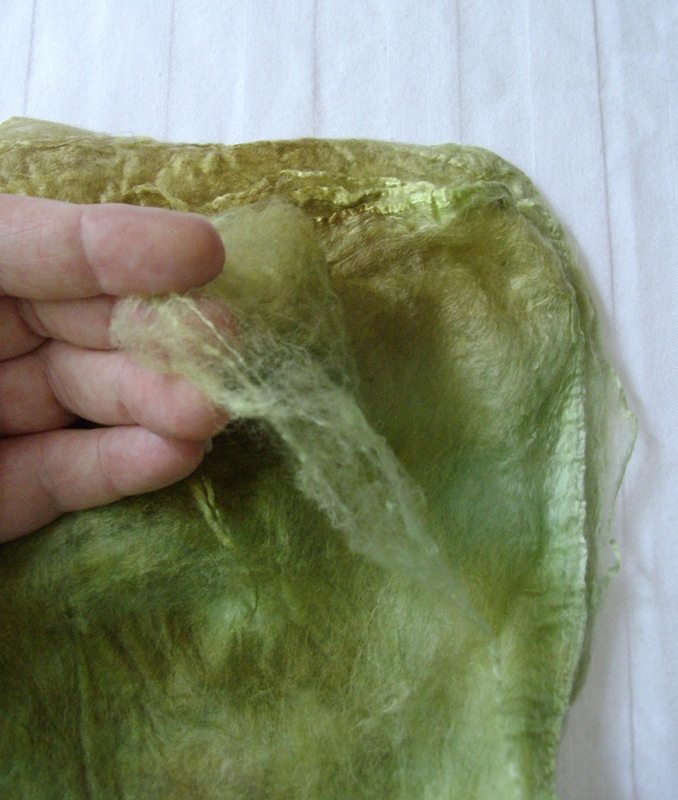 You’ll hear fibres tearing as you pull the silk out — that’s supposed to happen. 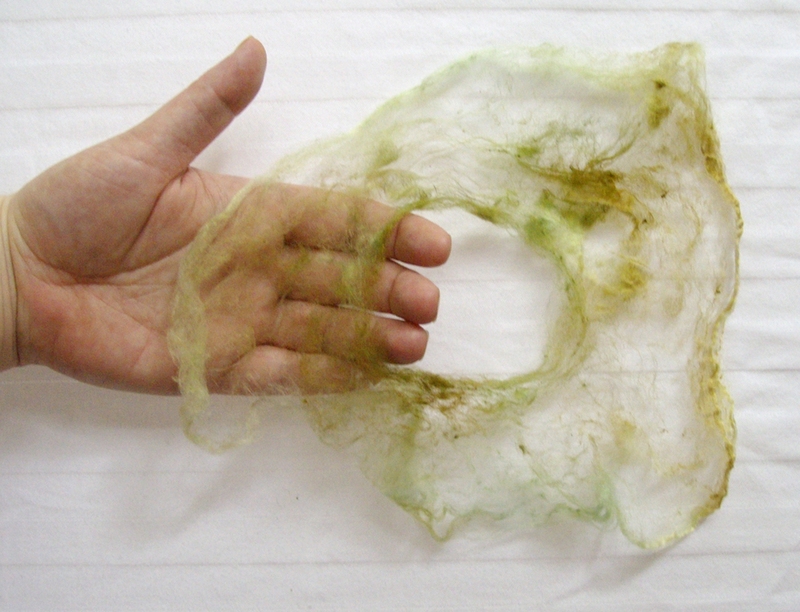 Keeping your hands about 12-18″/30-45cm apart and moving them around the circle as needed, gently pull the fibres out until they’re about the thickness you’re looking for. This is the thickness I like to work with. You may prefer a thicker or thinner strand. The fibre will be quite fluffy, so to check what thickness it will look like knitted up, twist a small section until it’s compressed and solid. See how much thinner it will end up? A bird should be so lucky. I make two or three bird’s nests at a time — enough to knit up in one go without over-committing — leaving the end sticking out of each one so it’s easy to find. You will never, ever, ever get a completely even strand from these. Your drafted mawata will be a bit thick-and-thin, and probably a little lumpy. It’s just the nature of the thing. This means that the gauge will be a bit variable throughout the fabric. As long as you keep the thickness of your strands reasonably consistent, it should all average out okay. How much silk will you need? Hmm. It depends, of course, on how many colours you’re using, how thick a fabric you’re making, and how large you want your finished blanket to be. 1 oz./28g of mawata will go a surprisingly long way, though. My squares measure 8″/20.3cm to a side, and weigh about 12g each. How do you join the next section? After all, you’ll be doing this a lot. Some people do a sort of Russian joiny thing with them (see below), which is a great way to join if you want distinct colour changes, as for stripes. 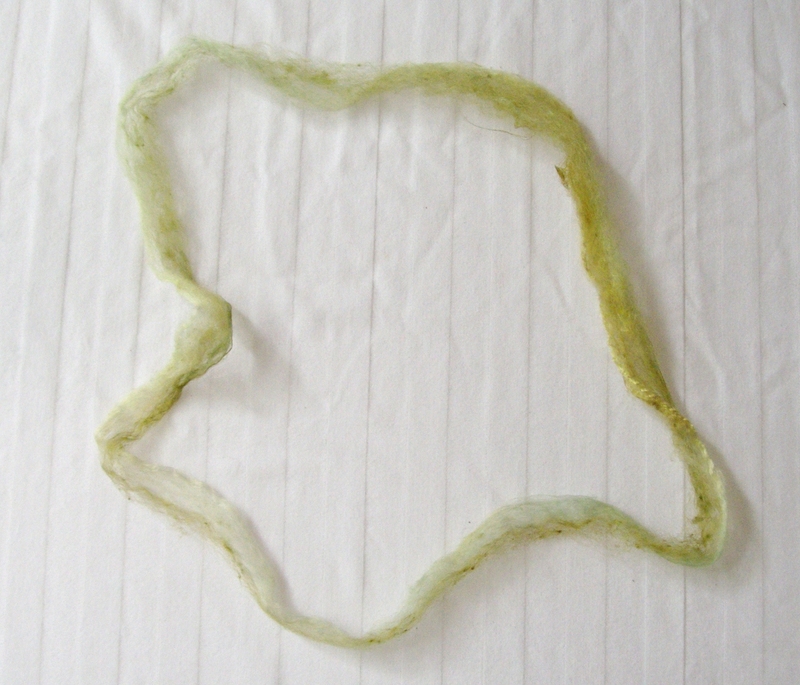 I just overlap the last 4-6 inches/10-15cm, knitting the end of one mawata with the beginning of the next, and snip off any stray ends as part of the finishing. 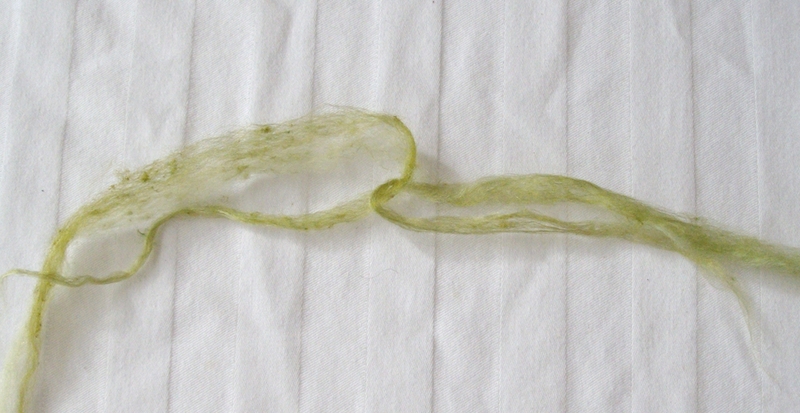 Because this silk wants to stick together, those ends will stay put. I’ve finished a square. How do I block it? The standard lukewarm hand wash, dry flat approach you use for hand knits works fine. You can pin the edges to make sure each square is exactly the same size, which will be helpful when it comes time to sew them together. 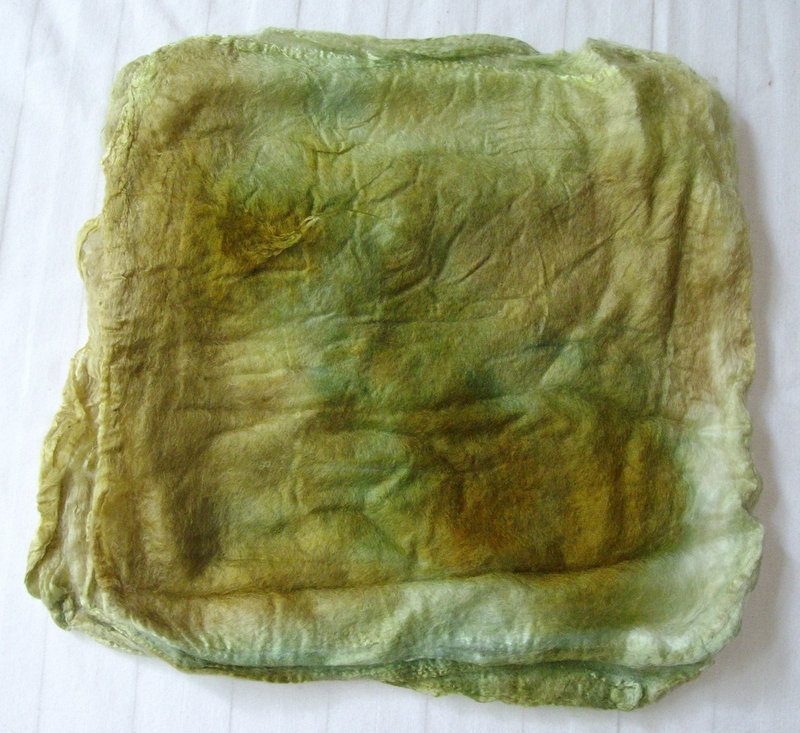 I found that some of the more intense colours bled quite a bit, even with vinegar in the water; putting a Color Catcher sheet in the wash water seems to stop that dye from transferring to lighter colours. So there you go. I think I’ve pretty much covered what you need to know, but if I haven’t, ask away — I’ll be happy to add anything I may have left out. Next up: recipes for the windowpane-ish squares. *For those who are wondering, these mawata (and most of the others in this project) are from Widdershin Wool Works. 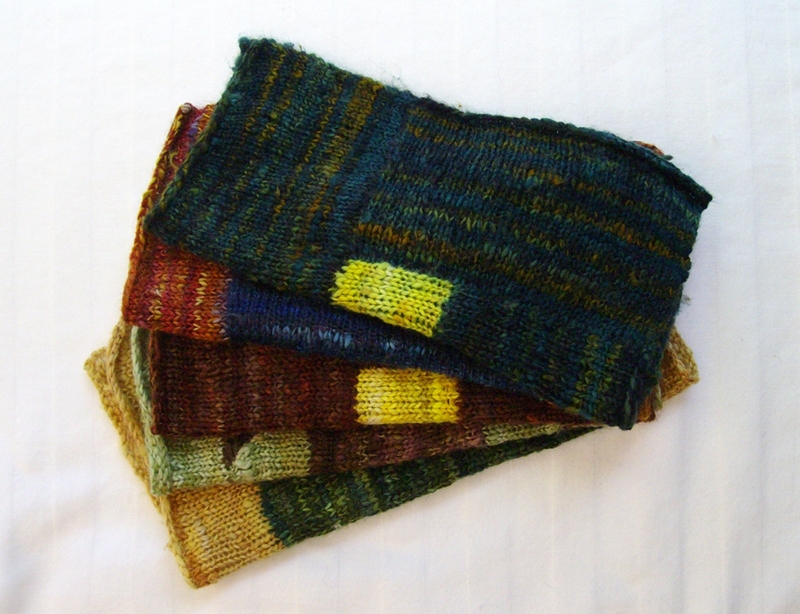 Update, August 4/15: Widdershin Woolworks has closed her online shop, alas. 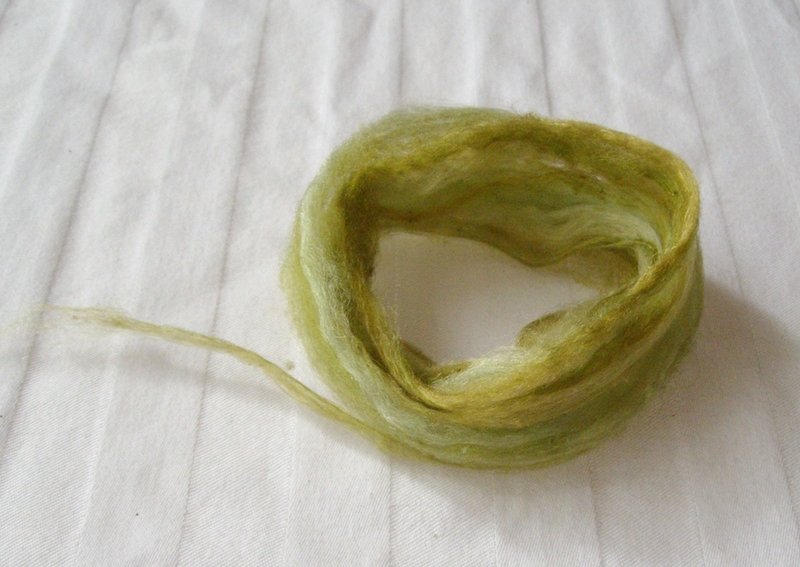 I’ve also bought some truly gorgeous mawata from See Jayne Knit and Miss Babs. 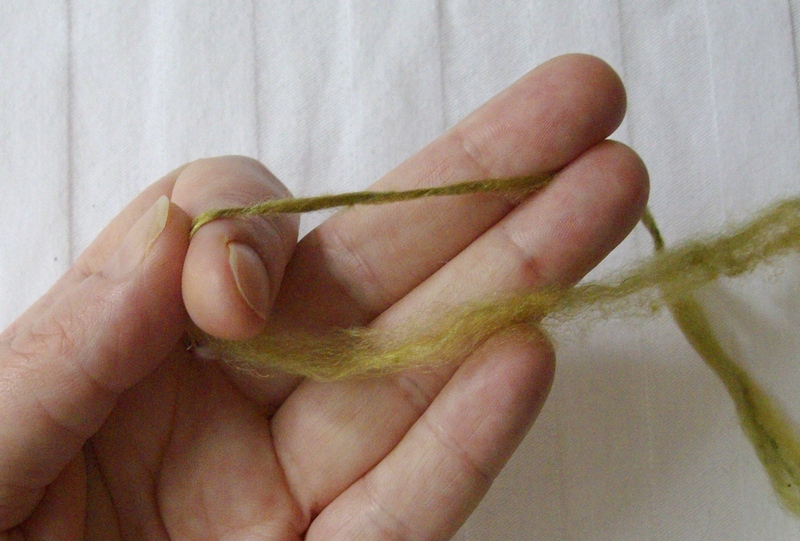 **If you were spinning these, you’d want to roll the fibre rather than wind it, to avoid adding twist before you’re ready to spin. 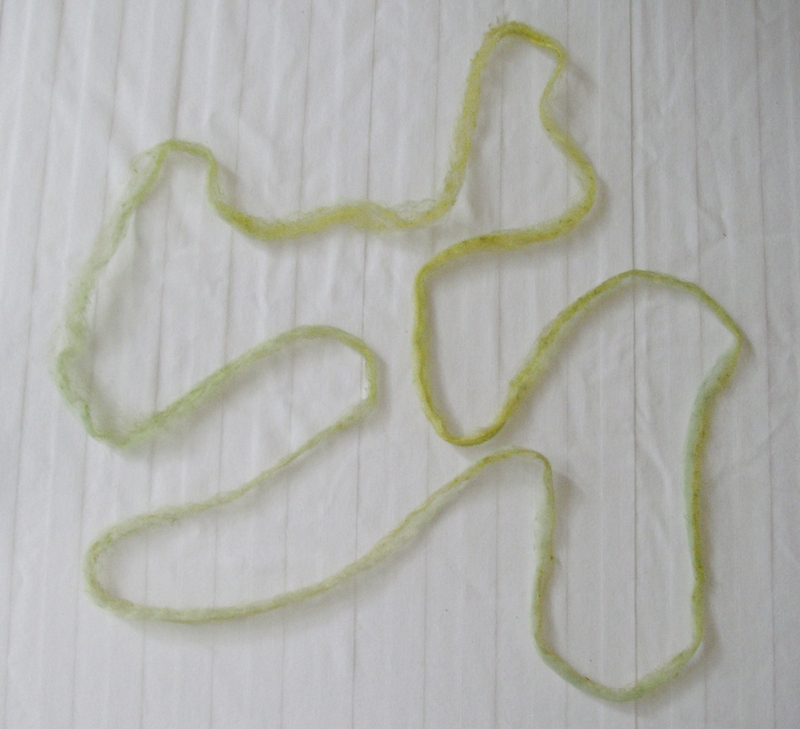 For knitting mawata in this form, the little bit of twist is helpful. Thank you! I do tend to go on a bit, but better more information than not enough, I figure.